MY NAME IS GREG MARTIN, AND MY WIFE AND I OWN A MOBIL DJ COMPANY IN POQUOSON, VA. WE HAVE DONE SOME WORK FOR SOME OF THE NNHS CLASSES IN THE PAST. I JUST LOVE ALL THE GREAT STUFF YOU HAVE ON YOUR WEB SITE AND BOY, DOES IT TAKE ME BACK TO THE GOOD OLD DAYS. Thank you again, Carol, for all that you do. Ferguson High graduate Tommy Penrose is a photographer who is now working on panoramic pictures for special occasions like class reunions. I am just passing along the contact for anyone interested. I saw the one he did over the weekend for a class from FHS. It was very good. I told him that I would pass on the info. Thanks! Thanks for help giving me point of contacts for any group pan pix possibilities. Thanks, Judy - and Tommy! I've reflected on your words so many times in the past four years. I'm so glad that I saved them! ADDED 10/09/07 held a reunion on Saturday, October 6, 2007 at the James River Country Club at 12 noon. Dr. Harold Cones spoke about the founding and development of the Mariners' Museum. ADDED 06/28/10 The NNHS Class of June 1942 meets at noon on the second Wednesday of every other month for a Dutch treat lunch at the James River Country Club, 1500 Country Club Road. The next luncheon will be August 11, 2010.PLEASE JOIN THEM. Give or take a few years makes no difference. Good conversation, food and atmosphere. on Thursday, June 26, 2014 at the James River Country Club, Newport News, VA. It was attended by 44 classmates and 29 guests, who enjoyed a reception, dinner, and memories. on April 23, 24, & 25, 2009. For details contact Dr. Harry Simpson at (804) 694-0346 or email him at hdsdds@aol.com. on Friday and Saturday, July 25 and 26, 2014.
or Betty H. Neher at 757 898 5099 or bjneher@cox.net. on the first Thursday of every month at Steve & John's Steak House on Jefferson Avenue just above Denbigh Boulevard in Newport News, VA at 11:00 AM. if you have friends in that year, go visit with them. Wednesday and Thursday, October 19 and 20, 2016. Wednesday, December 9, 2009 at Angelo's on Route 17. RSVP no later than December 6.
where we can see our old school and the different businesses we remember. Lunch is open. CONTACT: Gail Gaskins Roberson at 1gailroberson@gmail.com. ADDED 11/13/09 The NNHS Class of 1960 held a "Breakfast Brunch"
on Saturday, November 14, 2009 at 9:00 AM at the Candlelight Kitchen Rest in Croaker (Williamsburg). Any and all former students of NNHS are invited to attend! look for shopping center on left, Candlelight Rest on Right. at the Marriott Newport News at City Center, 740 Town Center Drive, Newport News, VA 23606. For details, contact Karen Weinstein Witte at kwwitte@gmail.com. Ignore Photobucket's attempts to get you to join (unless you want to join). It is not necessary to join to view the photos. ADDED 10/04/11 The NNHS Class of 1960 held a "Breakfast Brunch"
on Saturday, October 01, 2011 at 11:00 AM at the Warwick Restaurant. Any and all former students of NNHS were invited to attend! on Saturday and Sunday, June 13 and 14, 2009. Breakfast Sunday June 14, 9:30 AM – 12:30 PM at the Saunders home in Isle of Wight. But was forced to cancel, courtesy of Hurricane Irene. It has been rescheduled for Friday, Saturday, and Sunday, May 4, 5, and 6, 2012. "Any and all ex-Typhoons or old friends are invited." Joe and Mimma's Restaurant in Yorktown, 6:30 PM. Bring wrapped gift for gift swap. RSVP to Brenda Amos Williams at typhoonmom@juno.com by Monday, Dec. 12, 2011. 50-Year Reunion - Crowne Plaza Hotel, Hampton on the Water. More information after the Holidays. Meetings are second Tuesday of each month. 55-Year Reunion - Doubletree Hotel, 50 Kingsmill Road, Williamsburg, VA.
at the Crowne Plaza Hotel, Hampton on the Water. SEE: The website which has been set up for their class at www.nnhs1963.com. or Susie Overton Jones, tnsjones@charter.net. at the Newport News Marriott at City Center, 740 Town Center Drive. See: www.nnhs1964.com and contact David Spriggs at 757-409-2799 or nnhs64@cox.net. at the Holiday Inn Newport News - City Center. See: www.nnhs1964.com and contact David Spriggs at nnhs64@cox.net. (across the fountain from the Marriott Hotel), Newport News. No admission cost; run your own food and beverage tab. or Pauline Collins Shofner at pcshofner@verizon.net, 757-595-1965. 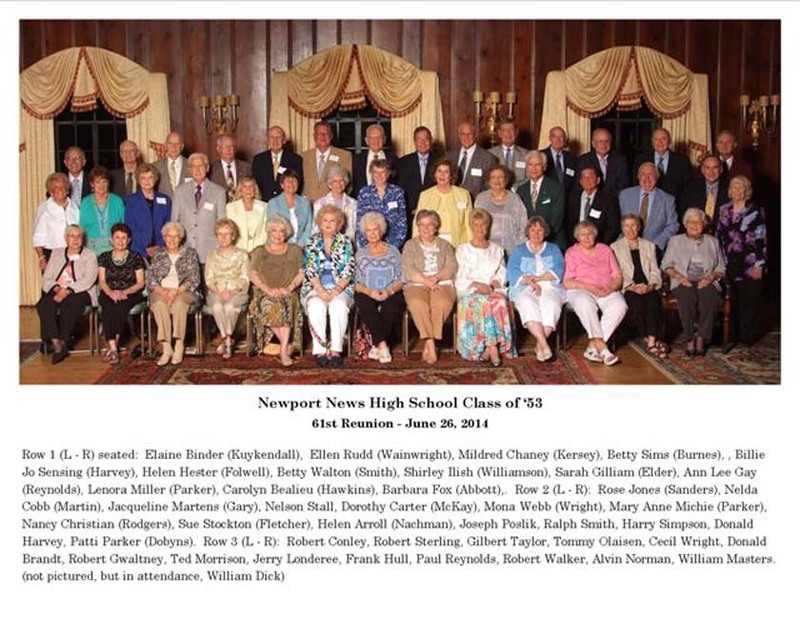 50-Year Reunion - Doubletree Hotel, 50 Kingsmill Road, Williamsburg, VA.
FRIDAY: 6:30 to 9:30 PM at Cove Tavern, Newport News City Center, 711 Lakefront Commons, Newport News, VA.
All food and beverages will be paid by each participant. The attire will be casual, and is OPEN to all NNHS graduates. SATURDAY NIGHT: Mulberry Inn on Warwick Boulevard next to Fort Eustis. For further information, contact Jean Baker Howell at hokie13mom@cox.net. o “Meet & Greet” - 7:00 p.m.
o Dinner & Dance (times forthcoming). Some people don’t eat breakfast or just have coffee, but we can still meet there and socialize. and we could have a group picture. The Marriott has set aside 20 rooms @$110.00 per night. The phone number is 866-329-1758 and link is below. When you mail your money in to Lee: please make checks to: NNHS CLASS OF 69, and mail to 3735 Carlas Hope Rd., Williamsburg, VA 23188. We all had such a wonderful time at the 40th and hope to make the 45th even more memorable for everyone. We are also still looking for classmates. Some have changed their email address since last time and I have no way of reaching them. The entire weekend - Friday night re-meet and re-greet with hor d’oeuvres served, a Saturday night dinner and dance and a Sunday morning breakfast - is $100 per person. CONTACT: Jean Baker Howell at hokie13mom@cox.net for registration forms. planned for Friday and Saturday, August 6 and 7, 2010 has been cancelled. Your NNHS 40-Year Class Reunion Committee has been working hard on your behalf to plan and coordinate a Reunion to remember. The Reunion for the Class of ’71 will be held on Saturday, July 9, 2011 from 6:30pm – 11:30pm at the Newport News Marriott at City Center located at 740 Town Center Drive in Newport News. Your committee has signed the required contracts to reserve a banquet room at the Marriott and we are excited about the current plans for that evening. In making the plans for this Reunion, we have had to pay the hotel a deposit to make certain that the banquet room and other plans are held for us. It is now time for those planning to attend to notify us of their intent and to submit a $50.00 deposit. As you know, planning an event of this nature requires funding and the source of this funding is from the people that will attend. We have made the first deposit thanks to the generosity of your committee members, but need for you to lock in your reservation and help financially by sending your $50.00 deposit by November 1st to our Treasurer, Virginia W. Pearce at 302 Gregory Drive, Yorktown, VA 23696. If you are interested in a room at the hotel for our reunion, the hotel has offered a special rate of $119.00 per night for those attending the reunion. To obtain this rate, please let us know so that we can establish the account with the hotel. A minimum of 10 rooms need to be reserved to get the special rate. To make this reunion a success, we need your support. Please plan to attend and pass the word to other classmates with whom you are in contact. Hey, I'm still just a kid, right?!? HA-HA-HA-HA!